It’s only when you’ve been working the same job for a couple months that you start to realize what aspects you could improve on. Foot rests for under your desk and a wrist support at an office, a rechargeable thermos for those that work in tough conditions, and bike accessories for those with a commute. There’s an app or product for just about anything you can think of. For those of you out there that work in a world of darkness, such as those who fish in the wee hours, are stage crew at a theater, or a nighttime photographer, light is a must, but it has to be in a controlled amount. You can’t swing a flashlight around or your work will be affected. 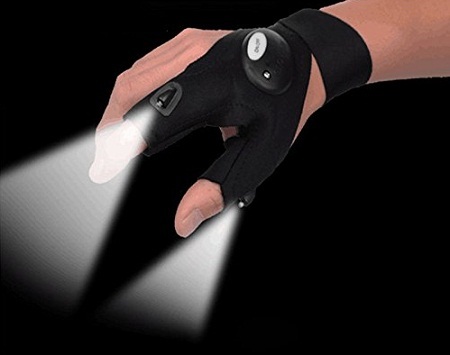 This Fingerless Glove with LEDs will make sure that you can not only see, but will be able to put your light only where you need it. This is a waterproof glove as its intent was for outdoor fishing, but is instead just an added bonus for anyone else who might want one. This is a $4.99 purchase, and you’ll need to make sure to check and see whether you’re buying for the right or left hand. This is made of spandex and cotton, which should make it comfortable, but something you’ll need to spot clean after a lot of use.